What’s not to love about fall? Pumpkin spice everything. Cooler temperatures. Football games. And corn mazes. Oklahoma has some great places to spend the day on the farm playing in the corn field, petting the farm animals and enjoying a hay ride. Here are 10 great places to take your family this season. Pocola is near Fort Smith, Arkansas, but it is in Oklahoma. 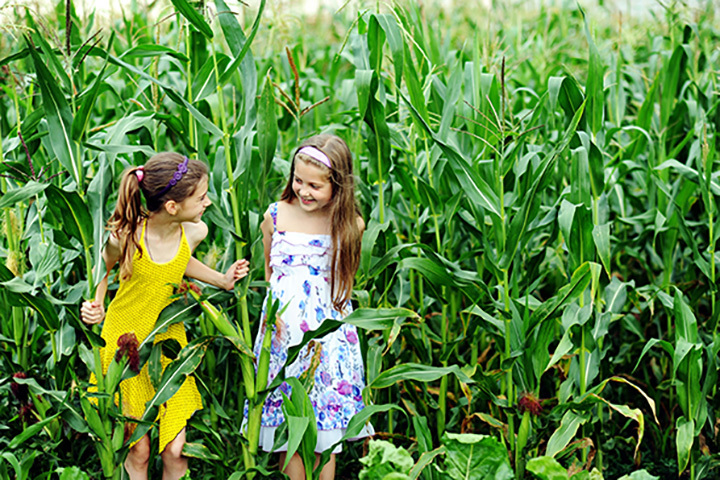 At Wild Things, enjoy a corn maze, flashlight maze, pumpkin patch, hayrides and a petting zoo. You can find the perfect pumpkin to decorate your porch and have a day of fun. This corn maze is the largest in Oklahoma, according to the website. Previous themes include tributes to the Oklahoma City Thunder, Oklahoma City Zoo-themed designs, and a tribute to Oklahoma bluegrass. Daze in a Maze offers 300,000 square-feet of a living field maze and lots of other fall activities. There’s even a hay bale maze for youngsters who might be overwhelmed in the corn field. Technically, this maze is made out of hay, but it’s a great place to come have a great time this fall. One price covers all the fun activities. Bring your flashlight if you come after sunset. The 3-acre maze is a lot of fun, but you’ll want to go on a hayride, play on the giant slide, pet the farm animals and remember to take your free pumpkin home with you! Annabelle’s has over 30 farm fun attractions. You can go through the corn maze, pick out a pumpkin from the pumpkin patch, hay ride, jumping pillow, pumpkin bowling, gem mining, candy cannon, petting zoo, and more, for one price. Rustic Acres is an excellent spot to bring the whole family. Along with a corn maze, they offer a hayride, goat petting, a duck race, pallet maze, a giant slide, picnic area, scavenger hunt, corn cannon, gem mining, and pumpkins for sale. The intricately-designed corn mazes at this farm are something to experience. Be sure to check out their maze after dark—and bring a flashlight! Fall is a great time at the Orr Family Farm. During the month of October, not only can you enjoy the corn maze, pumpkin patch, but on Friday and Saturday, you can watch some great fireworks. Sunshine Shelley’s has 15 acres of pumpkins and gourds, a five-acre corn maze, and hay rides. Kids will love all of the activities available at Sunshine Shelley’s. View more Oklahoma Corn Mazes.